A member of parliament (MP) says that Muslims should leave India and yet there is no action taken against him by his party. Forget, even the talk of disciplinary action, there is no need to even dissociate or distance itself from his statement (by the party). In any mature democracy, a responsible political party would be ashamed that its leader made such a fascist, communal and racist comment but NOT in India. 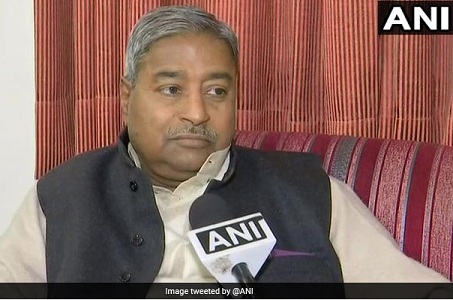 Vinay Katiyar doesn't have any qualms in making hate speeches or outrageous comments because speeches that seem to rival Nazi hate propaganda and threats against minorities, are considered normal in India. Katiyar has been an MP for several terms. Besides, he has been national general secretary of the Bharatiya Janata Party (BJP), which claims to be the biggest political party in the world on account of its membership. Just days ago, he made another vicious remark during Kasganj violence. He said that pro-Pakistanis were involved in violence. The word 'Pakistani' is directed at Muslims time and again to show him/her their place because of being a religious minority and doubt the Muslims' patriotism. If, in the world's biggest democracy, the senior leader of the main party can make such statements and get away, you can have an understanding about the manner in which democracy functions in the country. Katiyar, 63, hails from Kanpur. He has been a member of Lok Sabha from Faizabad, several times in the past. Right now, he is a member of the Rajya Sabha, the upper house of the parliament. There are specific laws against hate speech in India. The privileges-clout enjoyed by politicians ensure that they can get away with anything--spreading hate or even instigating communal riots. Media hasn't been too harsh on him for the 'outrageous' statement. It is commonly said that such people should be ignored but the problem is that he is no 'fringe voice' and ignoring has brought us to the situation where there are dozens of hate-mongers, as no one has fear of law. Besides, abusing or threatening Muslims is a sure-shot way to succeed in right-wing politics.